What do you get when you put 851 ukulele players together? "My contemplation is contemplation in action. I'm 76 years old. You learn a great deal about God's action in the world over that period of time and I find myself aware of the goodness of God in everything and everybody. Whatever is, is an inspiration to me. All that is, is holy, as far as I'm concerned. It's a great motivator to see life that way." If I had to use a single word to define what Quakerism (as I currently understand it) is all about, that word would be listening. The Quaker way is the way of listening. We spend time alone each day listening to God, and we gather in meetings to listen together. The result of this emphasis on listening to God and being taught/shaped/discipled directly by Him is that we are gradually changed from the inside. These changes work their way from inside of us out to our external life; manifesting in peacefulness, truthfulness, humility and practical concern for others--things which Quakers are known for. Listening means hearing deeply, internalizing and then taking action. 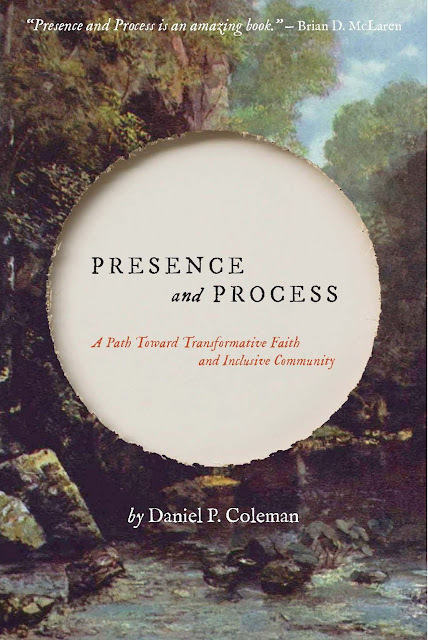 I'm coming to the realization that listening to God--and the resulting transformation which it brings--are the central theme of the Bible and at the heart of Christian theology. What is the root of sin but the failure to listen to God? What is discipleship and sanctification but the ongoing act of listening to God? Take the story of Adam & Eve in Genesis 2 & 3: Their sin wasn't eating the fruit--that was just a manifestation of their sin. No, their real sin was listening to voices other than God. In the tale of the Garden, Adam & Eve had direct communion with God. God "walked in the garden in the cool of the day." God interacted with Adam & Eve and instructed them, including setting certain boundaries ("You can eat from all of these trees except that one."). Eve gets into trouble by listening to the serpent and Adam gets into trouble by listening to Eve. Both Adam & Eve make the same mistake: they follow the advice of another who is telling them to do what is contrary to what God has taught them. To sin means to fall short. The Greek word translated as sin is hamartia which means "to miss the target." I don't believe in Original Sin (an Augustinian concept) but I do believe in Chronic Sin. The tale of the Garden provides a timeless metaphor of the error we all make. Though God is near, we instead choose to listen to other voices and, as a result, are led astray. The consequence we suffer is not Hell, but a self-imposed alienation from God. God responds to our failure and alienation with compassion. This is why Jesus came. Jesus came to show what God is like. He said, "If you've seen me, you've seen the Father." He came to break down the alienation from God which we experience due to the plethora of "other voices" which we follow throughout our lives. We are literally "born into" sin because of the the entrenched power of the "other voices" and the build-up over countless generations of the effects of Chronic Sin. But Jesus tells us ""Take My yoke upon you and learn from Me, for I am gentle and humble in heart, and you will find rest for your souls." (Matthew 11:29). When Jesus tells us to eat his body and drink his blood, He is not speaking of an external religious ritual but of imbibing Him--taking Him in--internalizing Him--being nourished and sustained by Him. We can do this through the intentional act of deep listening to Him. A Vineyard church I attended (and for a brief period of time was assistant pastor at) used to sublet our building on Sunday evenings to another church. We were in dire financial straits and the extra income was helping us make our rent. This other church belonged to a charismatic movement called "The New Wine" which was manifested by--among other things--people stumbling around like drunks, slurring their speach ala Foster Brooks and giggling uncontrollably. Sometimes I would stick around on Sunday evenings for the other church's service; in part to watch the spectacle but mainly to keep an eye on our sound system. The Sunday evening church would often have guest speakers--usually billed as prophets--who always had some unique gimmick that accompanied their ministry; such as dental fillings turning to gold or holy oil appearing in hands or gold dust falling from people's hair. These "miracles" were always preceded by accounts of huge revivals and amazing signs & wonders that had happened elsewhere due to the prophet's ministry. The prophetic words spoken almost always boiled down to a pronouncement that God was about to likewise do something really big in this town using this church. One evening the guest speaker was a short middle-aged woman from Latin America (I don't remember specifically which country). She was supposedly very famous throughout South and Central America and had been used by God to bring about massive revivals where vast multitudes had come to Christ and experienced miraculous things. And now here she was on a Sunday evening at this little church in this little town! The woman spoke little English and so had an interpreter with her. She liked to use the word fuego (fire) a lot. "Fuego!" she would shout, distorting the microphone and pushing her hand against the forehead of the next person in line to receive her ministry. Some people would fall backwards and be gently eased to the ground by waiting catchers. The Senior Pastor of our church was there that night. She called him forward and quoted to him from 2 Kings 13, where the prophet tells the king to take some arrows and strike the ground with them. The king strikes the ground three times but the prophet rebukes him and says "You should have struck them five or six times." "As a result," the prophet tells the king, "your military campaign won't be as successful as it could have been." The woman then told our Senior Pastor, through her interpreter, that God was going to ask him to do something, and that he must do it with all his heart. If he would do this thing God was asking with all of his heart, God would bring tremendous growth and outpouring of the Holy Spirit to his church. The thing God wanted him to do was ... dance. And so he danced ..., a clumsy, quirky soft-shoe that made him look like a marionette, while the little prophetess stood in front of him clapping her hands and shouting "Fuego! Mas fuego!" I love this cartoon. I know that some interpret it as saying that for us too the meaning of life is to eat, survive and reproduce, but I don't take it that way. To me it points out the clear distinction--which we all know is there--between humankind and animals: Animals are driven more by instinct than rational thought whereas humans are driven more by rational thought than instinct. Humans have the capacity to reflect about the past, to ponder the future, to have existential angst about the present. But we also still have that evolutionary instinctual drive to eat, survive and reproduce. I believe a big part of God's intention for humans is for us to learn to be aware of and in control of our instinctual behaviors. We display varying degrees of success at accomplishing this. To the extent that we allow Him to guide us and shape us, we experience success at being less animal and more fully human. Subject: Are we in the End Times? We have been for the last 2,000 years and the clock is ticking. But whether we see the return of Jesus in our lifetime or He waits 10 more generations isn't the point. The point is that the heat is being turned up right here in the United States on those who dare call themselves Christian. First the pastor in San Diego who was issued a citation for holding a Bible Study in his San Diego county home. He was threatened with zoning laws and told that he might be fined thousands of dollars. It was rescinded yesterday with an apology from the county executive, but not until the county was contacted by the church's lawyer. “…that would create a new class of crimes based on the traits of the victim, including "sexual orientation" and "gender identity." Under "hate-crimes" laws like S.909, pastors could be prosecuted for preaching the biblical view of homosexuality. Similar laws have been used to prosecute religious speech in the U.S. at the state level and abroad. So once again the key is, Do you know your God? Are you taking action for Him right now? Are you standing up for your beliefs and letting others know (with gentleness and respect) that holding to biblical values doesn't mean you are perfect, just that you want to be faithful to God? Many years ago I heard the question, “If Christianity were a crime, would they have enough evidence to convict you?” If we don't make ourselves known, that may not always be hypothetical. Subject: RE: Are we in the End Times? I think a much more sensible understanding is that Peter, Paul, et al were indeed living in the End Times. Though many couldn’t see it, the end was approaching for the Levitical system, the temple, the Jewish governing authorities, etc. Within a few decades they would be no more. This would have been a monumental occurrence to 1st century Jews. I’m sure you’re familiar with the events of 70 A.D. and have read Josephus’ account of the siege of Jerusalem. The “End Times” have been and gone. We live not in a pre-millennial “Last Days” where things are deteriorating towards a gruesome end, but rather in the continuing expansion of the Kingdom of God. And we get to participate in that expansion of the Kingdom, if we choose to. This is good news! So there you go. We can preach against the gays and hurt their feelings without having to worry about the Feds showing up on our doorstep. Personally, I don’t think Christians should be preaching and demonstrating against gays since to do so is not to follow the example of Jesus, Paul, etc. I heard Dobson on the radio the other day talking about “returning America to its Christian roots” and I had to wonder what on earth he meant. Although Christianity is in the mix of America’s roots, so is a huge dose of Enlightenment Deism. Not to mention slavery, religious intolerance (for example, the horrible ways the Puritans treated the Quakers in New England), marginalization of women, classism (only landowners could vote), land stealing, genocide against native Americans, etc., etc. “Christian America” is a myth. Like all of us as individuals, America was and is a very mixed bag—capable of great good and great evil. It seems to me that Christians nowadays can turn very ugly and un-Christ-like and downright idolatrous when we get our focus onto promoting conservative political values rather than on following Jesus and living the Sermon on the Mount. The case with the San Diego Bible Study that you brought up involved an overzealous zoning enforcement officer who stepped out of line and a pastor who, in turn, overreacted. The real issue though was not religion; it was parking. The county had received complaints from neighbors saying that attendees of the Bible Study were clogging the street and blocking driveways with their cars. The county’s Chief Administrative Officer has issued the following statement about the matter: "I want to say in the most direct terms: the County has never tried to stifle religious expression and never will." XXXXX, the reason I’m taking the time to respond to your email is because I believe we Christians, and especially Christian leaders, have a responsibility to be people of the Truth. We should not be propagating half-truths and rhetoric. What we should be is quick to listen, slow to speak and slow to become angry. The actions we should be taking for God are to love our enemies, to pray for our persecutors, to be peacemakers, to care for the needy, to seek justice for the oppressed, to heal the sick, to visit those in prison, to act justly, to love mercy, to walk humbly, etc. In doing these things, we will reflect Jesus, just as Jesus reflected the Father. Just offering an alternative Christian perspective. The man and the tanks. It has been twenty years since the Chinese government brutally crushed student-led pro-democracy demonstrations in Tiananmen Square. 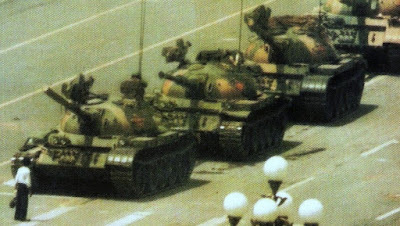 The most iconic image to emerge from Tiananmen Square was that of an ordinary man blocking the movement of four tanks with nothing but his body and a palpable sense of righteous indignation. His courage shamed the tank drivers and, by extension, the Chinese government. No one in the West is sure who the man was or what became of him. A few years ago a program called "The Cutting Edge" made a documentary about the "Tank Man". It's worth watching and remembering on this anniversary. Especially since the Chinese government has suppressed any mention or reminder of the event within their borders.